Made this store link at Ebay! Ebay now has this widget so I thought I'd have a try and post it. BTW, the new tatting pattern is up at ebay, etsy, and Patternmart if you want to buy it. FINALLY ! The first of my tatting pattern packs is ready for sale! Well here it is, at last, my first tatting pattern! I have been working on these patterns since 1995 when I was a member of my local quilt guild, Beaver Valley Piecemakers. I have dedicated this series of pattern packs to the members. 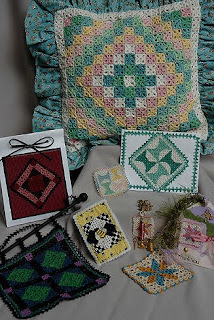 Right now I have plans for at least 1 more old fashioned quilts and 4 for each of the seasons. I'm working on Fall and hope to have it ready sometime next month. I call this pattern pack "Tatting Mini Old Fashioned Quilts #1". The patterns are printed like the rest of my patterns. There is a cover with a photograph, and info on the 5 patterns and basic instructions that are in the pack. The rest of the pattern is printed book-style with 1 booklet of basic directions and hints. Each pattern is printed separately so you can just have the pages you need. I also have some directions on what I did with each tatted piece. There are color photos and diagrams for each of the tatted quilts. Everything comes in a zip top plastic bag. Look for it at my Patternmart, etsy, and ebay stores in the next few days. I don't have it at my web site and won't until I get it moved. 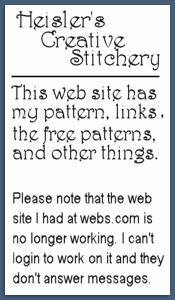 Remember geocities is closing so I'll be moving my web site. 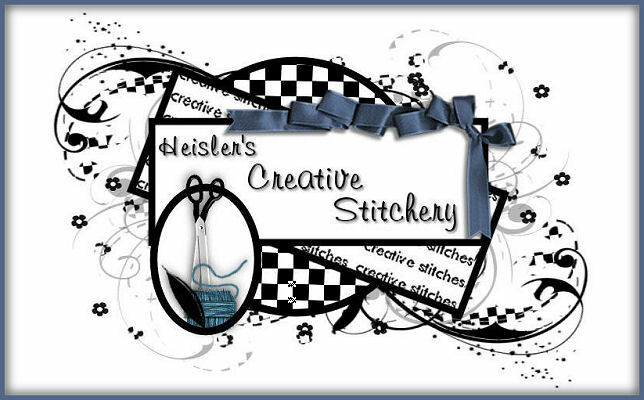 As long as you have it bookmarked as www.heislerscreativestitchery.com you'll find my site where ever I move it. Wow I have been so lazy this past summer. When I had trouble starting up the ebay store back in July I just said I'll try later. Then in August same thing, but last Friday I thought I better get on it since Halloween is next month and I have a lot of things to sell. 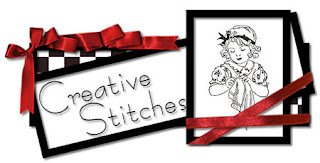 I decided to change the name of the store to Creative Stitches which is also my ebay id. I'm also thinking about changing my business name to that too cause the stitchery part doesn't fit anymore since I quit selling embroidery supplies. I'll fix the link so you can have a look at my new store with all new graphics, like the one above. I love the simplicity of the black, white, and red! Almost done (finally) with my first tatting booklet/pattern. I have 2 to finish and then take the pics. There are now 5 patterns in the booklet and I'm really pleased with how it's turning out.